Nymphaea leibergii has a rather limited geographic range and is apparently rare wherever it occurs. This aquatic species was first discovered in Minnesota at Bald Eagle Lake (Lake County) in 1914. It was subsequently found at Mulligan Lake (Beltrami County) in 1949, Botany Bog (Itasca County) in 1977, and Stony Creek (Lake of the Woods County) in 1980. In 1984, an attempt was made to relocate the population in Mulligan Lake, which had not been visited since the date of its original discovery. Mulligan Lake is rather remote and was never actually reached during this search. Surprisingly, other populations of N. leibergii were discovered during the attempt. The species was ultimately found in several rivers and streams in two major drainage systems in a 1,000 km2 (386 sq. mi.) area. These locations are within the sandy region of the Glacial Lake Agassiz basin and include the western branches of the Rapid River, which drains the Red Lake Peatland. More extensive searches conducted over a larger geographic area between 1984 and 2015 discovered and documented approximately 30 additional populations of N. leibergii. 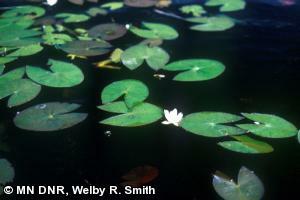 During these same searches, over 1,100 populations of N. odorata (common white water-lily) were recorded, providing some indication of the relative rarity of N. leibergii. Nymphaea leibergii has been listed as a threatened species in Minnesota since 1984. Nymphaea leibergii is one of two species of white-flowered water-lily that occur in Minnesota. The other species is composed of two subspecies: N. odorata ssp. odorata and N. odorata ssp. tuberosa, both of which have larger flowers and leaves than N. leibergii. The receptacle (structure on the underside of the flower that forms the connection between the sepals and the stem) of N. leibergii is very similar to the receptacle of the Canadian species, N. tetragona (pygmy water-lily) except that the lines of insertion of sepals are not prominent in N. leibergii, whereas the lines of insertion of sepals are very prominent in N. tetragona, forming a tetragon on the receptacle. Nymphaea odorata (both subspecies) has a round receptacle. The floating leaves of N. leibergii can look very much like the small, elongated leaves of N. odorata. The range of variation makes identification of sterile specimens difficult. Nymphaea leibergii has often been combined with N. tetragona, which is a circumboreal species rare in the United States and, as yet undocumented from Minnesota. N. leibergii was determined to be a separate species in 1888. However, the practice of combining these two species continued until Wiersema published the results of his research in the Flora of North America in 1996. All specimens bearing the name, N. tetragona from locations in the northern United States are now considered to be N. leibergii (Wiersema 1996, 1997). The documented occurrences of N. leibergii in Minnesota are in shallow, protected bays in lakes and in slow-moving streams, especially streams impounded by beaver dams. One site is in a narrow outlet of a small pond surrounded by a graminoid poor fen. The plants are usually rooted in soft sediments beneath 1-2 m (3.3-6.6 ft.) of water, although the water is sometimes deeper. They prefer the outer margin of emergent vegetation, which typically consists of Zizia aquatica (wild rice), Sagittaria spp. (arrowhead), Scirpus spp. (bulrush) and Typha spp. (cattail). The species frequently occurs with N. odorata and Nuphar variegata (yellow pond-lily). The flowers of N. leibergii are borne above the water surface, they are open for only a couple of hours each day, and they are pollinated by a variety of flying insects. N. leibergii seeds are dispersed primarily by water and secondarily by animals. The rhizomes occasionally become uprooted and float downstream, taking root wherever suitable habitat is found (Wiersema 1988). It is unknown how stable populations of N. leibergii are. They may fluctuate with local beaver (Castor canadensis) populations, which appear to provide habitat by building dams. The best time to search for N. leibergii is when it is in flower, from July to August. Exotic plant species such as Lythrum salicaria (purple loosestrife) have been known to choke out N. leibergii (U.S. Forest Service 2000), although this is not known to have occurred in Minnesota. With the increasing spread of L. salicaria, more populations could be threatened. Other exotic species such as Myriophyllum spicatum (Eurasian watermilfoil), Potamogeton crispus (curly pondweed), and Butomus umbellatus (flowering rush) must also be considered threats to the habitat of N. leibergii. Although populations of N. leibergii have been found in ponds that resulted from dams constructed on portions of small streams, it would be a mistake to assume that building a dam downstream or upstream of an existing population would be beneficial for the species. It is likely that this species colonizes new habitat only after habitat conditions stabilize. Human and terrestrial disturbances such as boat wakes, herbicides application, water warming, wild rice management, oxygen depletion, and siltation are also potential problems for this species. No conservation or management efforts are known to have been directed toward this species in Minnesota. U.S. Forest Service. 2000. Population viability assessment in forest plan revision. Questions for plant population viability assessment panel: Nymphaea leibergii. United States Forest Service, Region 9, Duluth, Minnesota. Wiersema, J. H. 1988. Reproductive biology of Nymphaea (Nymphaeaceae) Annals of the Missouri Botanical Garden 75:795-804. Wiersema, J. H. 1996. Nymphaea tetragona and Nymphaea leibergii (Nymphaeaceae): two species of diminutive water-lilies in North America. Brittonia 48(4):520-531. Wiersema, J. H. 1997. Nymphaea. Pages 71-77 in Flora of North America Editorial Committee, editors. Flora of North America north of Mexico. Volume 3. Oxford University Press, New York, New York.